This year the asparagus season has been delayed somewhat due to rain and low temperatures in April and early May but finally are coming to market magnificent specimens – in the province of Guadalajara there is a large expanse of crop- so last Saturday I prepared them with a drizzle of truffle oil with our truffle TrufaZero and, sucked our fingers! 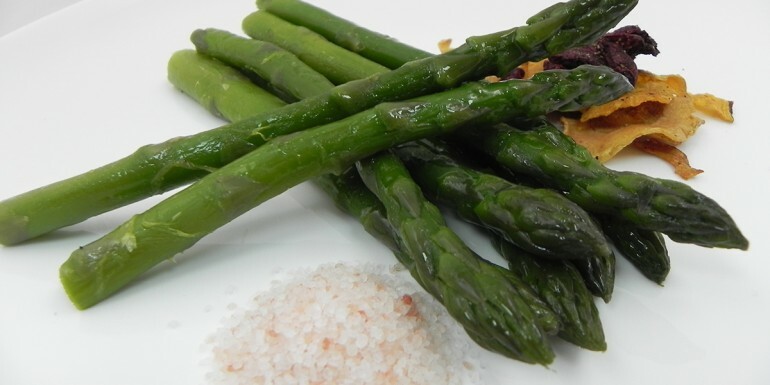 Remove the hard part of the asparagus and cook them “al dente” vapor or grilled them, let cool and cut into two pieces along. Cook the eggs until hard, peel them and cut them when cool into small cubes. Put in a bowl truffle oil and add the diced boiled egg for a while to take the taste. Cut the onion into strips and put to fry over low heat to caramelize. Once toasted bread slices put a bed of onion, the two pieces of asparagus and a few spoonfuls of truffle oil TrufaZero with egg.